I have written elsewhere of the Norman obsession with rectangles, at least as far as keeps are concerned. With the Romans, this obsession reached major proportions. They were also very keen on uniformity. So the average Roman fort was not only pretty much rectangular in plan, it also looked very similar to all the others. Notice that I have been careful not to say that all Roman forts were (a) absolutely rectangular, and (b) absolutely identical. Things did vary a bit. Still, there is scope for a spot of generalization. So here goes. A rectangular enclosure bounded by a thick high wall. 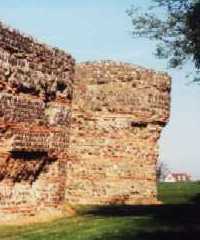 The wall having corner towers and sometimes more towers at intervals along its length. Said towers usually being of solid construction for the mounting of ballistae and such. Outside the wall, a broadish area of cleared ground, the berm. Outside this, at least one ditch, the vallum. In the middle of each side of the wall, a gateway, defended by twin towers. If you want to see a nice example of one of these, try the Balkerne Gate in Colchester, Essex. Inside the wall, and running around its inner perimeter, a roadway, the via something or other. More roads dividing the interior of the fort into a vaguely grid-iron pattern. In the centre of the fort, the headquarters building and the commandant's house. Next to that the hospital and granaries. The remainder of the area filled with barrack blocks, stables (if there was cavalry), etc., etc. Outside the fort, given time, various drinking dens, bordellos, gaming parlours and fast-food outlets.